The accident happened in the fast left-hander before Blanchimont as Burti was pulling alongside Irvine. Burti seemed to think that Irvine would give way but he did not, the Jaguar clipped the front wing of the Prost and removed it. "I knew Luciano was there," said Irvine, "but I simply did not expect him to have a go on the inside of that corner." The result of the brush with the Jaguar was that the Prost had no front-end downforce and so there was no steering. Burti hit the wall at about 150mph. At that point the wall was protected by tires four-deep. The Prost went under them and hit the wall with massive force but Burti was hit on the head by the tires and then pinned awkwardly in the cockpit beneath their weight. For a few minutes things looked bad. It took the marshals a long time to get to the car. In fact Irvine got there first and began pulling at the tires to try to release the inert Brazilian. But as the minutes went slowly by word filtered in that he was conscious and then that he was not in any immediate danger. But you never know with head injuries or big decelerations and so everyone remained cautious. The fact that they flew Burti away to hospital in Liege was a good sign. Serious head injury victims do not fly ” except in very extreme situations and clearly that was not the case. So F1's safety systems showed once again that they do work even if there does need to be more work on stopping cars diving beneath tire barriers. The race had to be stopped and that made for a lot of confusion as the rules about such things were changed last winter and now if a race is stopped the first part counts for nothing and so the race was restarted for 36 laps only. The grid was established by the finishing order of the first bit of the race. Michael's task was made somewhat easier by the fact that when the moment came for the race to be restarted, Ralf Schumacher's car was up on its jacks, the rear wing having been changed. This was deemed necessary because at the end of the first race Juan-Pablo Montoya's rear wing was found to have been broken. The Williams team did not want there to be any chance of danger and so the decision was taken to change the rear wing. But then time ran out. It happens. This meant that Ralf had to go to the back of the grid. Michael was basically left without a challenger. The first race start had been aborted when pole position man Montoya had his engine stall. So he had already been sent to the back of the class. With the two Williams-BMWs out of the way Michael had it easy. In fact he had it easy in the first race as well as his brother was holding up Barrichello. The McLarens did not have what was necessary to make an impression on this occasion. And so Michael strolled away to victory. The fact that he achieved the win at the wheel of the T-car seemed to make difference at all. "When everything fits together then you can do these kind of things and today everything fitted together," said Michael. "I was lucky getting the start and having Fisico between me and the rest for the later part of the race." The only excitement was when Michael went wide at Stavelot. "I was tuning the car from the inside," he said, "and I just mixed the apex a bit and ran wide. I didn't expect a problem but then when I was sitting on the curb I lost control of the steering for a while and I was a bit scared going into the wall, but luckily I got out of it. " Barrichello's day was rather less successful. He started well in the first race, jumping up from fifth to third. This became his grid position for the second race but this time he was beaten away by Fisichella and that meant that he was stuck behind the Benetton . At the first pit stops he was overtaken by the two McLarens and then things went from bad to worse when he hit a bollard going in to the Bus Stop chicane on lap 17. This knocked off his front wing and he had to do a complete lap before being able to pit. That dumped him down to ninth place and although he later moved back up to fifth, two points was not as many as he wanted as he tries to take second place in the Drivers' title from David Coulthard. Coulthard finished second to Schumacher on this occasion but his best lap was a shocking 1.8 seconds slower than Schumacher's. He spent most of the race stuck behind Fisichella. "Giancarlo was doing an amazing race," David said. "Obviously his car was working better than it has done this season and he was quick in all the right areas: out of La Source and out of Stavelot, so it was very difficult to get close." He was also being sprayed by oil from the Renault. "I was having to wipe my visor on every single straight," he said. "I understand it only just made it across the line, so I think it was spitting all its oil out as the race went on." Eventually Fisichella lost a bit of momentum passing a backmarker and Coulthard pounced and went ahead at the top of the hill as they braked for Les Combes. But second from ninth on the grid was a good effort and Coulthard was pretty satisfied. "It doesn't look quite as good as it sounds because obviously a lot of cars dropped out," he said. It was a better result than Mika Hakkinen could manage. He was fourth in the first part of the race but lost out to Coulthard and Barrichello at the start of the second. Some good work got him ahead of Barrichello at the first pit stop and he had to work hard to keep Rubens behind him but after Rubens had gone there was not much to do. "I could not charge in the last part of the race because of a handling imbalance," he said. "So I had to settle for fourth place." Fisichella might have been disappointed with third but Benetton's year has been pretty dismal and this was a big boost for the team. A lot of people thought that the engine must have more power but that was not the case. The team had a new aerodynamic package and it worked. Just as technical director Mike Gascoyne said it would a few months ago when the pressure was really on. "The car was much more competitive, easier to drive, easier to get a good set-up, with much more grip," said Fisichella. But the fact that really made the difference was the start. In the first race he went from eighth to third. In the second from sixth to second. And if that makes him sound brilliant it is worth noting that software also had something to do with it as Jenson Button went from 15th to ninth at the first start and from 10th to sixth at the second. Unfortunately Button had some understeer in the race and could not hold on to his place and slipped back to 10th. Under pressure from Ralf Schumacher on lap 26 he hit one of the cones at the entry to the chicane and the front wing fell off and without downforce he went off into the wall. The final point of the day went to Jean Alesi ” which must have been satisfying for Eddie Jordan who hired Jean to score points. He had a hell of a fight in the final laps holding back Ralf Schumacher and rumor has it that Eddie Jordan went stomping off grumpily thinking that Alesi had lost out because Ralf had won on aggregate. It apparently took some time to convince him that the rules had been changed ” at which point he was delighted to have been proved wrong. But there was also disappointment because Jarno Trulli, who had been running fifth, went out with the largest cloud of oil smoke seen in F1 for some time. Honda admitted that the engine had failed. 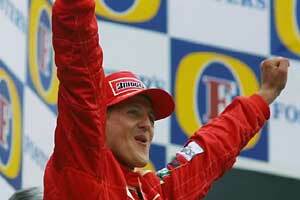 Ralf Schumacher crossed the line just behind Alesi after a very miserable day for Williams. The team had taken 1-2 in qualifying (with Montoya faster than Ralf Schumacher) but at the start of the parade lap the engine did not fire up properly and when it came to the start it stalled. The start was aborted and Montoya was sent to the back of the field. At the start he went charging up the field but he was still only 15th for the restart. When he stopped it was pointed out that his rear wing was broken and Williams decided to change Ralf Schumacher's rear wing as well, just to make sure. This was going on when time ran out and Ralf was left sitting on his jacks as the field drove off. So he was down the back as well. Montoya made a great start second time around and was trying to drive around the whole midfield when Pedro de la Rosa was punted into him by Nick Heidfeld, who had been hit by Jos Verstappen. The result was that the car was behaving oddly. And then the engine went bang. A bad day. Ralf's was pretty bad as well. His progress through the field from the back of the grid was pretty slow. The car was not as competitive as it had been in qualifying trim and Ralf was struggling. He was not helped when a tire gun malfunctioned at his pit stop and so the team went home with no points. Eighth at the flag was Jacques Villeneuve in his BAR which was a pretty dull result given the fact that Jacques had qualified sixth by being in the right place at the right time on the right tires. In the first part of the race Jacques dropped back to eighth and then in Part II the two BARs made a big mess of it at the top of the hill when Jacques went off, rode across the grass like a lawnmower racer and rejoined right in front of Panis, which caused poor old Olivier to take to the grass on the other side of the track. Olivier must be getting a little bored of being bumped into by his team mate. Oddly enough the team's press release failed to mention that this had happened which was odd for a team which likes to be seen to be open and honest. Still there was plenty more to write about as Panis was given a stop-go penalty for crossing the white line exiting the pits after his first stop. Then his second stop was slowed by a problem with the fuel nozzle and by the time he had undergone all of these misfortunes he was back in 11th place. Alesi's one point put Jordan back on equal points to BAR in the battle to be the top Honda team and so, as the field heads to Monza, there is everything to play for. If BAR would stop shooting itself in the foot it might do rather better. Heinz-Harald Frentzen finished ninth a lap down but the weekend was a vicious one for Prost. Heinz-Harald had done a very good job to time everything right in qualifying and he was fourth on the grid. This was exciting stuff for a team used to trolling around at the back with the Arrows and the Minardis. But at the start his car stalled. The start was aborted and HH was sent to the back of the grid. It was a disaster and an anguished looking Alain Prost appeared on TV. Worse was to come with Burti's shunt. And after that there was disappointment in the race. Frentzen was on a one-stop strategy and it did not really work so he ended up trolling around with an Arrows at the back. "We used up all our luck yesterday," said a disgruntled team member. Jos Verstappen finished 10th. This was not a bad effort given that on Saturday neither he nor Enrique Bernoldi (nor the two Minardis) went fast enough to actually qualify within the 107% rule. The stewards said this was OK and that it was perfectly all right for non-qualifiers to start races (which seemed a little odd). So Jos finished 10th and Bernoldi finished 12th. Minardi managed to get Tarso Marques home which was a bonus because he stalled at the start (but when you start at the back they cannot send you further backwards). He then ran over debris after the Irvine-Burti accident and that resulted in a long stop for repairs. But he finished albeit four laps behind the winner. Fernando Alonso wiped his car out in the morning warm-up and so had to go for the spare. He then went out after only three laps in the first race with a gearbox problem. With the team having watched its two Formula 3000 drivers collide on Saturday it was not a weekend that Paul Stoddart will remember fondly. Jaguar Racing without Bobby Rahal proved that miracle cures do not exist. Pedro de la Rosa outqualified Eddie Irvine (as is now becoming usual). They were 10th and 17th on the grid. And then both men had accidents. It was a grotty weekend for the team and the morale, battered by the departure of Rahal, did not improve. Sauber too had a dreadful time. Raikkonen looked promising in the first race but then went out with a transmission failure (similar to two such failures at a vital moment in qualifying) and Heidfeld fell victim to the bumping and boring at the first corner. And so F1 packed up and went home. Everyone these days seems to like to see a Ferrari win (except Ron Dennis) and everyone was happy that there was good news from the hospital in Liege.